The construction of new venues in the 250-acre Olympic Park, have transformed what was previously industrial land, in the heart of east London. While the London games will be unable to compete with the scale of the 2008 Beijing games, London’s architecture is no less interesting. Despite most of the attention being focused on the Olympic Stadium (completed in April 2011); it’s actually the smaller venues such as the Velodrome and the Aquatic Centre that deliver more aesthetically pleasing designs. The Velodrome, designed by Hopkins Architects, is an elegant £95 million building that has recently been shortlisted as the best building in Europe by RIBA Stirling. 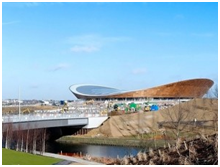 It is the most sustainable venue in the Olympic Park in terms of design and construction. Sustainable choices were made wherever possible; from the sourcing of wood certified by the Forest Stewardship Council, for the track as well as external cladding; to the installation of a 100 per cent naturally ventilated system, which creates a perfect track-level temperature, eliminating the need for air conditioning. The design of the venue, which has been nicknamed ‘The Pringle’, because of its smooth, curved elliptical lines, makes optimal use of natural light, reducing the need for electric lighting. The lower concrete tier, which surrounds the track, will have the capacity to house 3,500 guests – whilst the two upper tiers will house 2,500. Between these two separate floors a large glass wall has been installed, giving spectators a 360-degree view across the Olympic Park as well as allowing people outside the venue to see the sporting action taking place inside. The Olympic Aquatic Centre, designed by international architect Zaha Hadid, is another beautiful piece of 2012 architecture. The centre, which is part of the ‘gateway’ to the Olympic Park, will have the flexibility to accommodate up to 17,500 spectators for the main competition pool and diving, as well as an additional 5,000 seats for the water polo venue. After the games, 2,500 temporary seats will be removed and a ‘leisure water’ facility will be added turning the centre into a permanent fixture in the Stratford community. 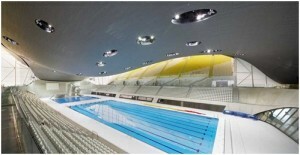 The structure, spanning almost 11,200 square feet and measuring 160metre in length, is inspired by the fluid geometries of water in motion – its large glass fronted facade and spectacular roof, that sweeps up from the ground as a wave, encloses the pools of the centre with a unifying gesture of fluidity. We’re looking forward to see these buildings, among others, when the fully functioning Olympic Park is finally complete. If you like to find out more about the range of glass building products offered by Pilkington Glass, please visit here.